Now a new generation of pioneers, both trained architects and self taught farmers, are creating a unique element of charm for us city livers. Lucky residents can live in and harvest from them. The rest of us can look up or down (if we live in nearby tall buildings) with delight. This page will feature some interesting photos that I have found on the Internet, of roof gardens in Africa, Asia, and the Middle East. Hopefully this page will evolve as more people there enrich their lives with such ventures, post them online, and Google helps me to find them. Later, I hope to create a similar page for gardens in Europe and the Americas. Below are excerpts from some websites I found. 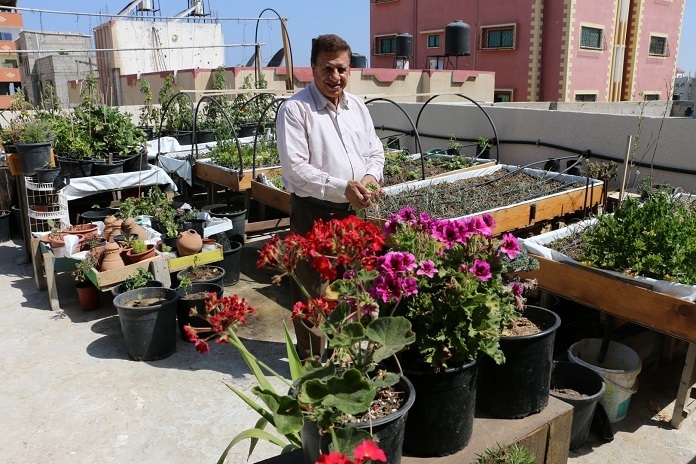 In search of a solution, Ahmed Saleh, citizen of Gaza, started his own roof garden. His idea was to use the space to plant vegetables. A PhD in agricultural engineering, he first came up with the idea when studying different approaches of roof gardening and urban agriculture, searching and communicating with his fellow specialists in agriculture. When Ahmed Saleh started to move from theory to practice, he followed a model of two steps in order to achieve the best results: First, he collected scrap and garbage such as old tires and wooden boxes in order to use them as planting containers. He also created an effective watering system, connecting a main water tank to the planting containers using recycled water pipes. Second, he fertilized the soil using chicken and fish waste. He then set out on some test growing, planting lettuce, oregano, celery, onions, tomatoes, pepper and eggplant, and trying to identify the crops that survive best under the local conditions. … Studying and researching, Ahmed Saleh improved his crops continuously. After a while, he was able to identify the reasons behind the failure of some crops and improve his yields…. With the average of 500 US dollars per 50 metre rooftop unit, the cost of roof gardening is reasonable compared to its benefits. By being able to cover the needs of whole families in the long run, gardening can greatly reduce the expenses for food in daily life. In a suburb area of Heliopolis, about 15 km from Cairo, Latif plants eggplant, spinach, cabbage, oranges, mandarins, parsley, dill, lettuce, tomato and, occasionally, cucumbers. He ’employs’ two scarecrows dressed in traditional Egyptian attire to keep away raptors and other birds that come to steal his prized vegetables. Once the plants have matured, Latif gathers small bunches of herbs and his fruits and vegetables which he proudly sells on a small stand in front of the building to residents and passersby who have been his friends for years. FAO has supported rooftop gardening, training 48 families in the use of hydroponics systems and other techniques to grow fruits and vegetables on their roofs. Through the project families also learnt the “green productions,” techniques decreasing or eliminating the use of pesticides. Fatima, one of Latif’s friends, has been growing her roof garden for years and knows all the secrets to doing it successfully. This 76 year old woman with a big heart, has such vast knowledge of growing vegetables and herbs, she now voluntarily provides agricultural advice to new ‘roof farmers and growers.’ …. The next excerpt offers a realistic assessment of the hurdles to overcome in building roof gardens in Cairo. When the Persian traveller Nasir Khusraw visited the Egyptian capital in about 1050, he wrote in his book the Safarnama that residents in the wealthy and densely populated area of Fustat had put gardens on the tops of their high-rises. The tallest of the buildings stood 14 storeys, and the gardens were irrigated using ox-drawn water wheels placed below. The potential benefits are obvious. In addition to improving general aesthetics, green roofs act as insulation, which is not usually a factor in Egypt construction – especially in poorer neighbourhoods, where top- floor apartment are usually ovens. Green roofs absorb heat from the environment as a whole. The ubiquitous asphalt and concrete can increase the temperature of a city by three or four degrees compared to that of surrounding farmland. But the problems are myriad. One of the biggest is ownership. Very few buildings in Cairo are properly registered, especially in the poorer neighbourhoods where rooftop crops might provide the most benefit. Deciding who has the right to the roof is an obstacle. Then there is the problem of who is responsible for the services. Many of the electricity metres in poor areas are not registered under the name of the owner. Water metres tend to be communal, so all the building’s tenants can end up financing the people irrigating and harvesting the crops on the roof. Sherif Hosny, the chief executive of Schaduf, which bills itself as the leading green roof and wall garden company in Egypt, says his company began a pilot project in Cairo’s Bulaq district in 2012, with a non-governmental organisation lending a hand. Their original idea had been to set up 100 rooftop gardens to grow produce, which the urban farmers would then sell back to back to a cooperative store in the upmarket neighbourhood of Maadi. 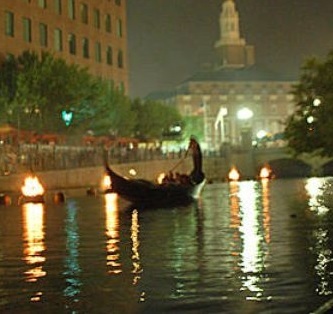 But almost immediately the project hit problems. “In poorer areas, there are usually complicated ownership issues. People rarely have the proper documentation,” says Mr Hosny, whose company has also received support from GIZ. Microfinance organisations usually ask for three things before lending – an identification card, non-family references and an electricity bill. Schaduf had trouble finding people who could provide these. In one neighbourhood it could only find two people who could fulfill all three criteria. The Bulaq project fizzled out. Schaduf turned instead to setting up vertical gardens and ornamental rooftop gardens for the rich, and it says business is booming. Previous A Grape Vine Grows in Manhattan –150 bottles from one rooftop.